Before we take a look at some effective guitar tuning tips, make sure you've been through the main guitar tuning page as there are lessons covering many different methods of tuning up. This lesson will offer you some useful tips to help you fine-tune and make sure you're tuned up accurately. Sometimes you can be very slightly out of tune on just 1 string, but as soon as you play a particular chord that emphasises that string it also emphasises any inaccuracy. 1. Once you think you've tuned up (using whichever method you've chosen), try playing chords right across the neck to make sure the tuning is accurate. Some chord voicings can highlight inaccuracies better than others. 2. You can also compare the same note on two or more strings to check that the guitar is at least tuned to itself and all the strings are working together in tune. 3. You can use harmonics to pick up on the vibrating effect that occurs when two strings aren't tuned perfectly to their interval. The truth is, some guitarists simply don't have an ear for tuning. Some guitarists will be satisfied with a guitar that's "there and there abouts" in tune. Don't let that be you, because although not everyone who hears you play won't pick up on these minor inaccuracies, some will (even if they don't know what's causing it to sound "off"), and it will compromise your music. 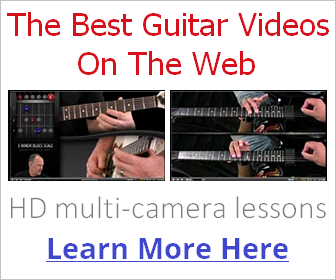 You can train your ear to instantly pick up on any inaccuracies in your tuning. Let's look at an example of how you can use the notes in a chord to tune up accurately. One variation of the open G major chord includes a note twice. So you can look for two occurrences of the same note within chord shapes you're familiar with and listen closely to check they're both tuned together (all barre chords contain two "root notes", one an octave of the other (higher, but still the same note). Most guitarists are familiar with the 5th fret method of tuning, but many also find it can yield inaccurate results, depending on the setup of your guitar. This is because with the 5th fret tuning method, while fine for just casual playing on your own, involves tuning an open string to a fretted string which can cause natural inaccuracies (especially with cheaper guitars). However, you can overcome this by tuning fretted strings to other fretted strings all over the fretboard. Those two strings should be exactly the same note (with the G string being the higher octave), and tuned together accurately. Guitarists commonly tune up and find that if you do the test above, the G string sounds too high or low and it needs adjusting. There are more string relationship diagrams to help you tune like this on the note relationships page. Tuning using harmonics is a more advanced method, but a very accurate way to fine tune the guitar, more accurate than the 5th fret method. It involves using your ear to pick out imperfections in the intervals between the strings. To hear these imperfections more clearly, we use harmonics to create a high pitched frequency that oscillates when an imperfect interval between two notes is sounded. As you tune the string more perfectly to its interval, this oscillation effect straightens out. Very difficult to explain in plain English, so see the lesson on tuning harmonics for more on this method. Hopefully now you have some good guitar tuning tips to work with and make sure your music isn't destroyed before it begins!